Let’s face it, the summer came and went in those two weeks in April. Or was it March? No matter, it has been and gone and left us all damp, uncertain and pining for sunshine. I spotted a gap of five days in my calendar and decided if I didn’t get away then it would be August before I could escape and to be honest the thought of two months without sunshine was more than I could bear. Having seen the villages of the Amalfi Coast in a number of films, it has always been on my hit list. So finally my chance came, and I grabbed it. The brooding Mount Vesuvius casts an unpredictable shadow over the city of Naples, which is spread at its foot. The city is famed not only for the volcano, but for its pizza and gelato but it also has some beautiful buildings, interesting museums and on its outskirts, the intriguing Pompeii. While I wanted to browse the cobbled streets, enjoy a pizza and stroll through the pretty squares slurping on a gelato, time was limited, so we jumped into a taxi and headed for the coast. There is a bus outside the airport that will take you directly to Sorrento in just under an hour and a half for €10, but if you’re willing to spend the €65 on a taxi it is worth it. Our destination was not Sorrento, but a hotel 10kms outside, near a pretty town Vico Equense and a mere 25 minutes from the airport. 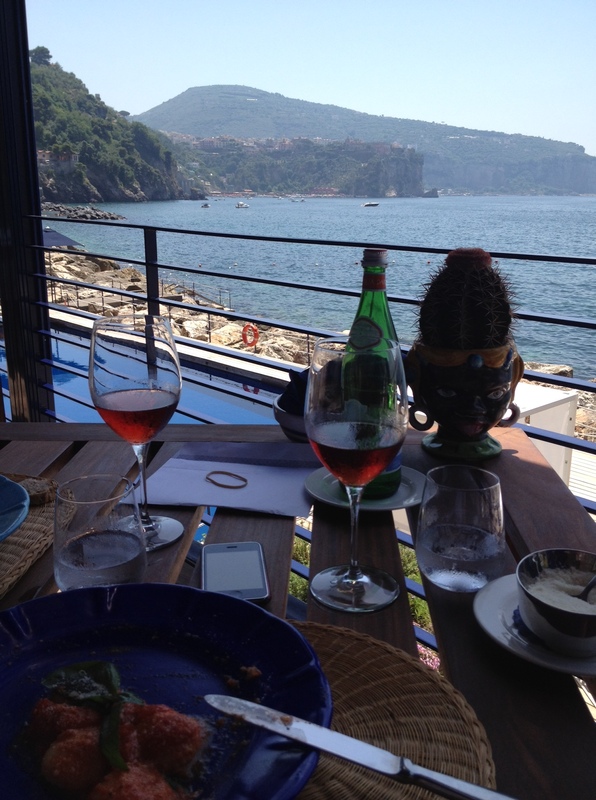 Having left a wet and cold Ireland only four hours earlier, we were sitting on the terrace of the stunning Capa La Gala enjoying a lunch of pasta, salad and a glass of rose by lunchtime. I don’t think I’ve ever needed sunshine so much and as the blue skies stretched overhead and the sun beat down on the sparkling ocean, I smiled smugly. I’ve never been one for frills and I find some 5 star hotels try too hard, but Capa La Gala has managed to create an elegant, tranquil and relaxed haven along the buzzing Amalfi Coast. 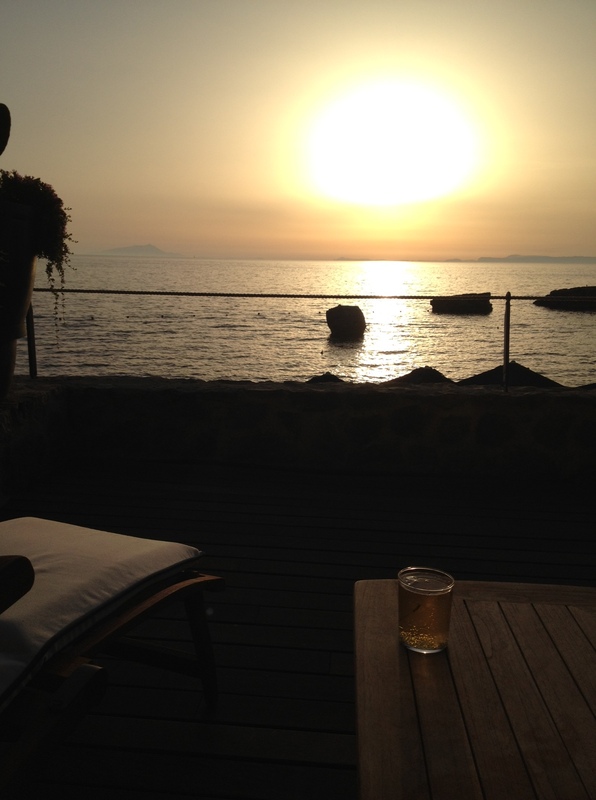 Designed with a distinct nautical theme, the hotel makes the best of its uninterrupted views across the Bay of Naples. Meals are enjoyed on a narrow terrace where every table gets a ringside view. The hotel is a maze of small nooks and crannies, decked out with cosy couches, lounging chairs, local art and sculptures. 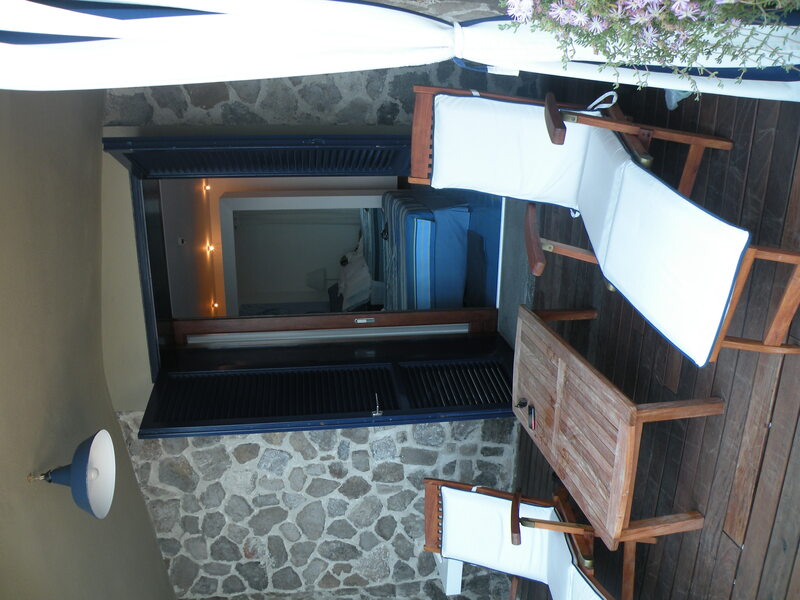 Our room was slick, elegant and understated, until you opened the french doors that led out to a balcony with two deck chairs and the most incredible views of the sea. This is where we watched the sun set and welcomed the heat of the day in the mornings. It was difficult to leave our peaceful retreat, where when we swam off the rocks in front of the hotel the only sound was that of the seagulls soaring above. Sitting in the shade, friendly staff would bring chilled sorbets to cool our overheating bodies and the only thing I wanted to see was my book and the view before me. The plan to visit Vesuvius, which is only a ten minute train journey from the hotel and the lovely island of Capri, were thrown to the wind. Alas, I could not call myself a travel writer if I sat in my hotel for five days (I could easily have done this) and despite the heat, we explored the local village – Vico Equense, a charming town bustling with locals going about their own business. From here we took the train to Sorrento, passing by one lemon grove after another. Sorrento welcomed us with its busy streets, pretty boutiques, and smiling locals. I can understand how it makes a great base to explore the area, with lots of hotels to choose from, an abundance of great restaurants and bars. We strolled through the town, browsed the shops and found ourselves at the Bristol Hotel, a beautiful, old-world hotel with the unsurpassable views over Sorrento and its surrounds. We enjoyed drinks on the roof-top terrace and then moved into the grand dining room, where floor to ceiling windows ensure diners are treated to the finest views. Each course (there were four) was better than the next, prawns to start, pasta for seconds, fish as our main and then dessert, delicious! 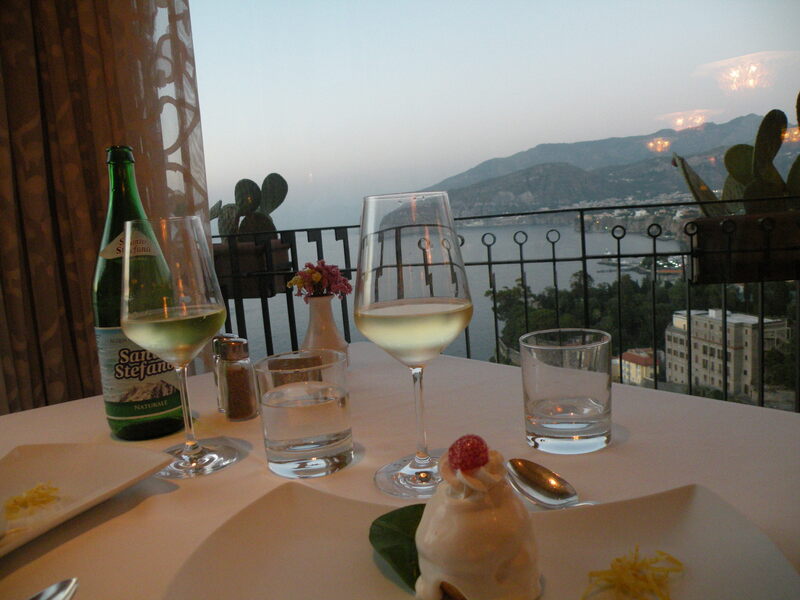 As we sat in the beautiful dining room, looking out across Sorrento we were pleased as punch we had made the effort to explore! It was strange leaving behind the bustling town where tourists sat outside cafes and restaurants chattering away, enjoying the warm evening. However, when we returned to our balcony and poured ourselves a limencello, the sound of the waves lapping up on the rocks beneath, I felt like I’d returned home. Renting a car during the peak summer months can be costly, so we opted to do an arranged tour of the Amalfi Coast. I’m not a massive fan of coach tours, I tend to rebel and walk off leaving the group and the rambling tour guide, but this was the most enjoyable trip I’ve done. Our guide was funny and knowledgable about the area. We drove along the winding coastal road and I thanked my lucky stars I was not driving. 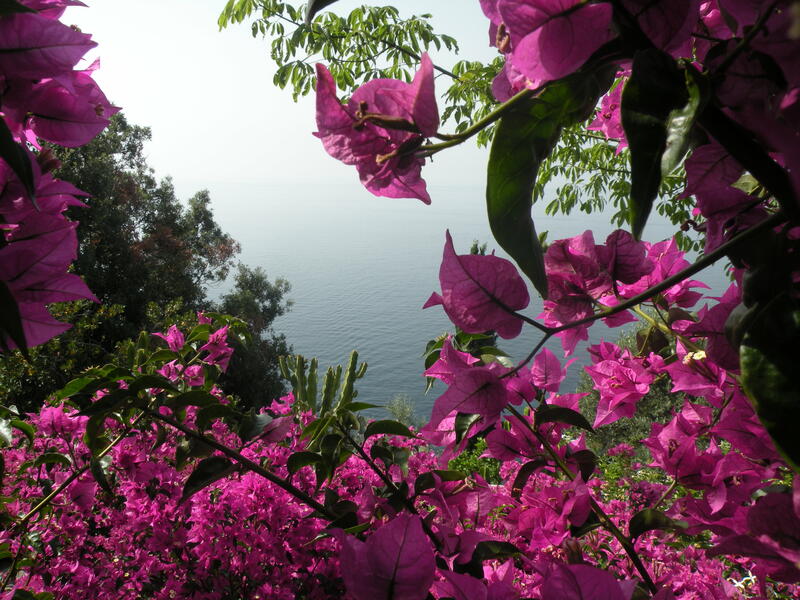 The sheer drops with no rail to stop us from plummeting to our deaths sent shivers down my spine, but I placed all my trust in our competent driver, sat back and listened to the tales of the Amalfi Coast whilst oohing and ahhing at the dramatic views. I talk about the drive in detail in my post – Coastal Drives. While the drive is long, it is a fantastic way to spend the day, however by the end we were tired and a trip back into Sorrento was never going to happen. So that night, we dined by candlelight in the hotel’s terrace restaurant choosing from the A la Carte menu and were wooed by the delicious dishes, wine and relaxed atmosphere. Restaurant Maxi is a michellin star restaurant, yet was delightfully void of the pretentiousness that so often accompanies such a title. It was a remarkable evening and one to remember. If you fancy getting away to the sunshine, somewhere where you can eat well, relax, swim and enjoy spending time with your partner, stay at Hotel Capa La Gala, do day trips into Sorrento and drive the Amalfi Coast. Believe me, you won’t be disappointed. Capa La Gala will go down as the most romantic hotel I’ve visited, and indeed one of my favourite hotels in Europe, while the Amalfi Coast will go down as one to return to. 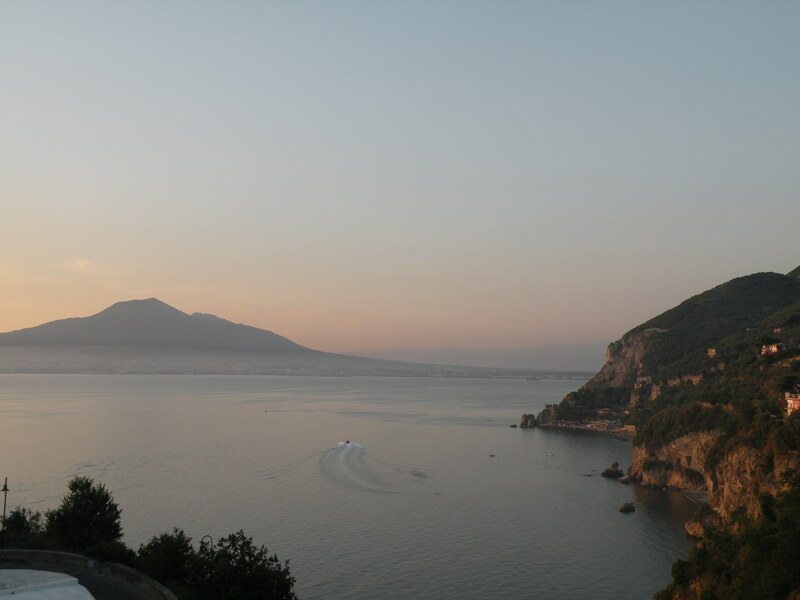 Afterall, I have to visit the bubbling Vesuvius and the lovely Capri. 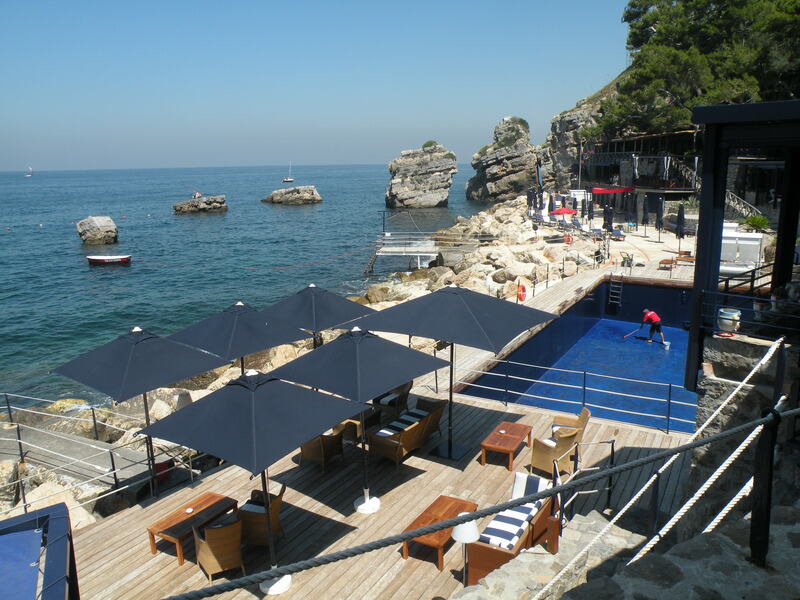 Topflight arrange 5 – 7 day trips to the Amalfi Coast offering a range of accommodation from 3 -4 star to 5 star, including Capa La Gala. It is a very easy way to travel as they provide all transfers, have a wonderful rep called Lyndsey in Sorrento who will tell you all the places to go, help you if you get into trouble and generally give you a warm Italian welcome. They also do arranged trips to all the major sights – Capri, Pompeii, Amalfi Coast, (this is the tour I did which was fantastic!) and more.